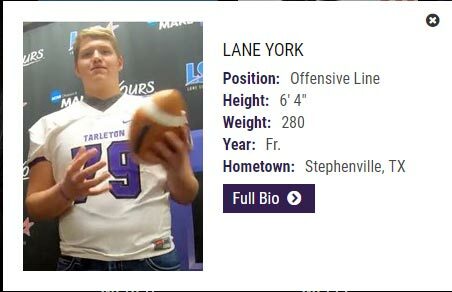 STEPHENVILLE – Stephenville High School’s Lane York has played plenty of football games at Tarleton’s Memorial football stadium and he’s elected to make it his college home after signing a national letter of intent to play for the defending Lone Star Conference champions. “We feel like we’ve added a really good group of guys,” said head coach Todd Whitten. “Obviously, it’s a little foolish to brag too much on these guys until you get them here and start working with them because there are a lot of variables that go into making really good players. Everyone feels good on signing day, but we’re excited to have these young men joining our team. “Now the real work begins,” he added.